People I meet in person often find what I do unusual because I’m a remote worker who works very flexible hours. And those who know me online often assume I’m based in their time zone, USA time zone, or I’m a bot! 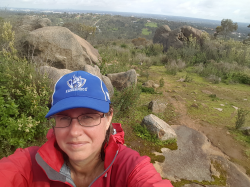 So I thought sharing a glimpse of my work life would provide an insight into what life is like as a remote worker. I’m the Support Manager for Edublogs and CampusPress — part of Incsub which is also behind WPMU DEV. Inscub Is a specialist WordPress company with over 60 employees. We’re spread across different countries and time zones; most are remote workers like myself. Much of my day is spent testing, supporting people using our blogging platforms, or working with our support team, developers and sysadmins. I’m a notorious multi-tasker and can be working on several tasks at the same time. 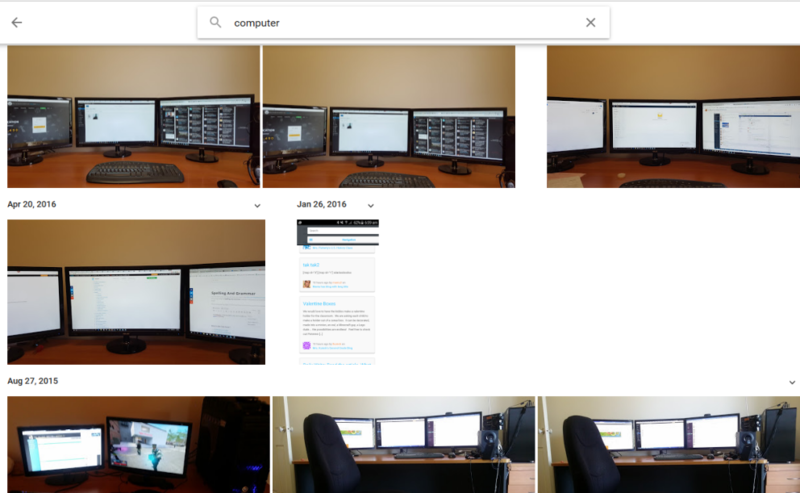 I have a reasonably large desk with x3 24″ monitors. 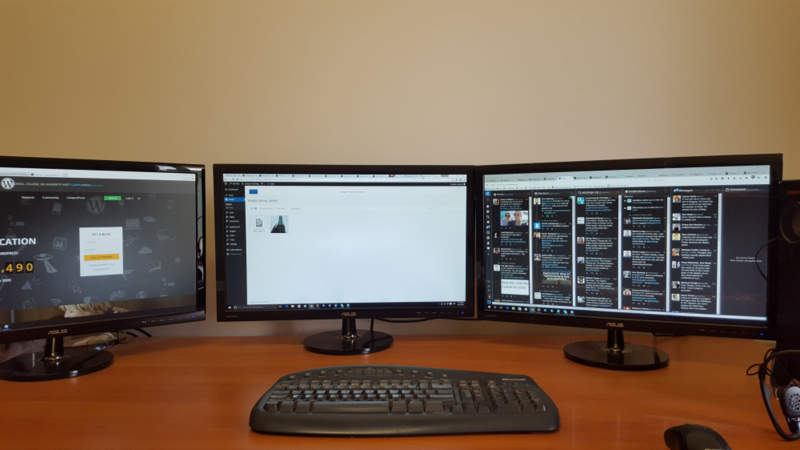 I would have a fourth monitor if it would fit on my desk! How does anyone get any work done with one monitor? I run Windows because most of our users are Windows users. My computer is housed in a noise reducing case — hate excessive computer noise! Photos from my phone automatically upload to Google photos when I connect to wifi. Search in Google photos is incredible! It’s very accurate. Rather than take a photo I quickly searched my computer to find the latest photos of my set up. 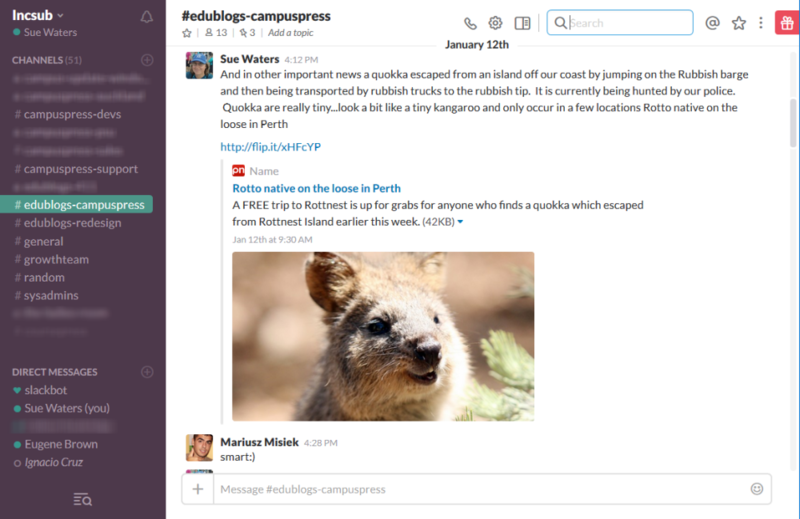 We use Slack for most company communications — with different slack channels for different teams or work tasks. Slack provides real-time messaging, asynchronous messaging, enables us to send direct messages to each other, and lets us search for previous discussions on a topic and supports voice calls. Our slack conversations are generally very work focused. However, we also use it for the occasional personal chatter, as highlighted above, like you have in an office. Helpscout is used for all email communications. It enables multiple staff to access at the same time and for emails to be assigned to different people with notes. We use Google Docs and Google Spreadsheets because both enable us to work collaboratively and add comments for feedback. We use Asana for managing tasks and projects. And off course Twitter! I have TweetDeck set up on my computer set up logged in @suewaters and @edublogs so I can quickly provide assistance by Twitter as needed. I don’t work standard hours. My work hours are flexible to fit in with when I need to work with other team members and to support our users. And my phone is my portable work office for when I need to deal with something quickly if I’m away from my computer. After all the articles written on why we shouldn’t take our mobile devices to bed, you would have thought that I would have learned by now? Even after accidentally answering Google Hangout after midnight when I turned over the device. 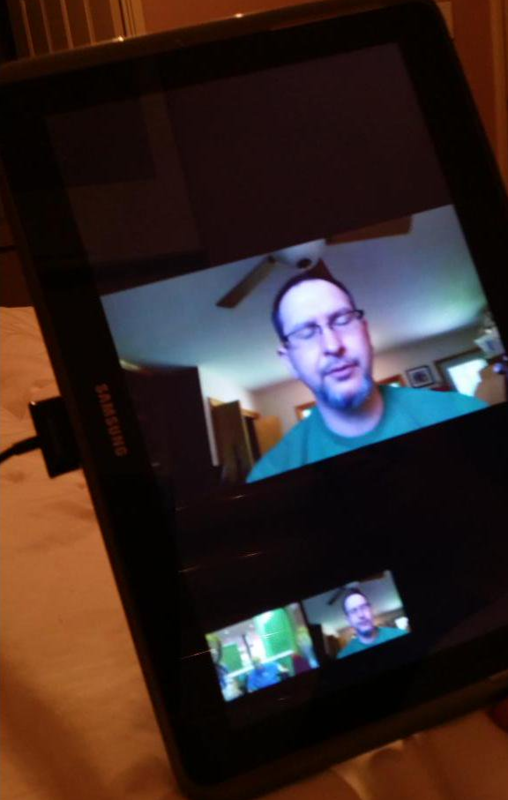 Nothing like a live webinar from bed at 1 AM answering questions when you can barely think (and not dressed for the occasion). FYI William Chamberlain in the above photo isn’t the person who rang me! He was one of the participants and probably wondered why I was making no sense. Or waking up to snake photos from my South African work colleague who was excited to share his latest photos; knowing I’m scared of snakes and I would be seeing the images as I wake up once he was asleep. This post is part of the ongoing #EdublogsClub series. Check it out and learn more here. Hope you enjoyed the quick tour? Was there any thing else you would like to know about what I do? Thanks for sharing this post. 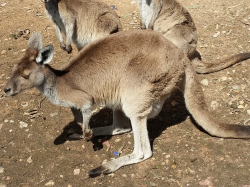 It is a very enlightening peek into the world of a remote global worker. I think we all need to get used to not having set office hours, particularly in education where it would much better suit the needs of the student if we could be there for them when they actually need us. I am not sure I would have liked the midnight hangout though! There are pros and cons like any job. I love working with people from different countries, the flexible hours and I don’t miss the long drive to work stuck in traffic jams. I miss interacting with my students and work colleagues. Hi Sue. I enjoyed reading about your office set up and work habits. I laughed out loud when you asked, “How does anyone get any work done with one monitor?” I worked from home on a 17″ laptop for two years — with not even a monitor, just the laptop screen. Now I have a 27″ iMac and a second monitor. I look back at life before two monitors and shake my head. What was I thinking? My team also uses Slack and I LOVE it. I appreciated learning about HelpScout. I’ll keep that in mind as our team continues to grow. 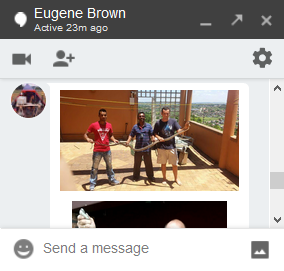 We use Zoom for our synchronous video conversations and love it! Hi Michelle, I know! I used to work with only one monitor. I really struggle nowadays if I have to use a laptop because I have my keyboard set up exactly how I like it on my computer. I like most Slack features — except when one of my colleagues posts an animated gif (I need to be careful viewing animated gifs) . Slack is better for group conversations however Google Hangout chats are considerably easier for finding history of important chats. Hi Sue, yes you are correct about assumptions. What an interesting and busy life you lead. I hope I can manage to have a beautiful clean desk like you have in the very near future, however I do not want to wake up to pictures of snakes. Oh no, Cath! I should have added a note to my photo saying this is what my desk looks like when I clean it to take a photo. I used an old photo. My desk is normally covered with scattered paperwork etc. Cleaning it is on my to do list. He also tweets snakes at me!